I turned into the drive of an old, substantially large mansion house in Lawford. I was there to give a quotation to the Lady of the house that I had just gotten off the phone from. Mrs Clarkson had requested a quote as soon as possible. As I was within a few hundred metres of the house I agreed to come straight round. I know you might be thinking “so, what’s unusual about that”. Nothing apart from the vehicle I was in. The vehicle I was driving was one of our trucks, that when going to do a quotation isn’t the best of vehicles to turn up in. Saying that, at least the customer knew I get involved in doing the work as well. Not just doing the managerial work alone. I rung the door bell and introduced myself to Mrs Clarkson. 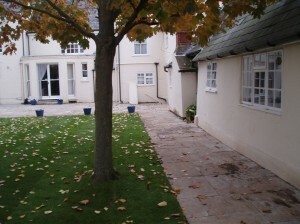 The client took me round to the back of the house to show me the existing courtyard. We then discussed some ideas and designs but Mrs Clarkson was in favour of a more modern finish as one of her friends had suggested. Now I will usually let the client have what they would like. On this occasion I knew this would absolutely spoil this grand old stately house. What I suggested was to use Indian sandstone paving in Raj Green. Now you are thinking “green!! is this man out of his mind.” Calm down and let me explain in case you don't know. Believe it or not, Raj Green paving is not green. It is a collection of light and dark yellow sand, grey to browns of every shade and includs some very mellow earthy pinks! This I knew from my vast experience would absolutely complement this wonderful old mansion and make it look like it had been there for years. Mrs Clarkson decided she would like to have a quote on this option as I said I would rather walk away from doing this job than putting down something that I knew would not go with the fantastic building and spoil the idyllic setting. Yes you heard that right, the end result is more important to us than the money. We submitted the quote and within a day we had a phone call to say it had been accepted and when could we start. This project was started three weeks later in November. The first thing we had to do was mark out the new paving area. The existing site of the old concrete and shingle areas were then cleared. Once this was done we found really wet and soft clay underneath. We had to excavate deeper so we could stabilise the area. We then brought in type one crushed concrete and spread it over the surface. Unfortunately, before we had a chance to compact this, the heavens opened up. It then continued pouring for the rest of the day and most of the next. When we went back we just could not do anything due to water standing everywhere. We had to pull off site for a week to allow the area to dry out, I didn’t have to explain to the client as she could see the problem for herself. Once we were back we compacted the area down and made sure that all the falls were correct, so once the paving was laid any surface water would run into existing surface water drains and onto lawn areas. We started to lay the raj green paving in a truly random pattern as we had five different sizes of paving to allow us to achieve this. The paving was laid on a 2 inch (50mm) bed of semi dry screed mix with 0.5 inch (13mm) to a 1 inch (25mm) gap between the paving slabs to allow for a mortar joint to lock the paving into position. Just while I am thinking of this did you know there is a right and wrong way to lay these paving slabs? I know these are called Raj Green but don’t say "green side up". On this paving all the edges are tapered and what a lot of people do, including so called experienced paving contractors, is to lay the paving upside down so the widest part of the slab is at the bottom so forming an upside down pyramid for the joint instead of a pyramid the correct way up to lock the mortar mix in the joint. Why some people will do this incorrectly is because the jointing can be done quicker, but it will not last! The jointing mix we use is the same screed mix we are laying the paving on but add more cement and admix. The cement makes it stronger while the admix - also known as plasticiser, is a liquid that allows the mortar to be pliable without it being runny as you are not putting the water content in. This allows you to put the concrete mix in the joints and over the paving without the worry of staining the paving when ironing in the joints with a tool that is called a jointing iron. We then prepared the new lawn areas by rotovation, levelling and removing any large stones. The grass turves were then laid leaving a striped pattern. To achieve this, all we did was to lay one row of the turves left to right. The next row was laid right to left from where we finished the previous row from and so on. As you can see from the pictures this Indian Raj Green paving just blends itself perfectly. The great thing about it is it looks like it has been there since this wonderful Georgian Mansion was built. The client was over the moon with the end result and was so glad that I insisted on this paving. I did ask Mrs Clarkson what the other quotes were so I could compare our price against the other contractors. Surprisingly, her reply was, “I did not get any more quotations once I had spoken to you. You advised me on what you knew would suit the property. If the product I chose wasn't suitable,you told me you were prepared to walk away. This alone, absolutely astonished me. You certainly don’t get that happen nowadays. The other thing was you didn’t turn up in a big fancy BMW wearing a suit. I am so glad I went with my instinct as what you have achieved is so wonderful. The summer just can't come soon enough so I can really enjoy this space. I am already talking to my gardeners. We are planning where we are putting pots and what plants we are going to have”. Another paving job carried out successfully using Raj Green paving. With the end result of having another very happy customer that we can now add to our portfolio. 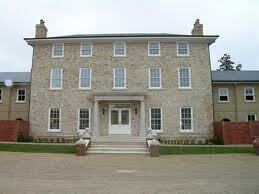 I turned into the drive of an old, substantially large mansion house in Lawford. I was there to give a quotation to the Lady of the house that I had just gotten off the phone from. Mrs Clarkson had requested a quote as soon as possible. As I was within a few hundred metres of the house I agreed to come straight round. I know you might be thinking “so, what’s unusual about that”. Nothing apart from the vehicle I was in. The vehicle I was driving was one of our trucks, that when going to do a quotation isn’t the best of vehicles to turn up in. Saying that, at least the customer knew I get involved in doing the work as well. Not just doing the managerial work alone. I rung the door bell and introduced myself to Mrs Clarkson. The client took me round to the back of the house to show me the existing courtyard. We then discussed some ideas and designs but Mrs Clarkson was in favour of a more modern finish as one of her friends had suggested. Now I will usually let the client have what they would like. On this occasion I knew this would absolutely spoil this grand old stately house. What I suggested was to use Indian sandstone paving in Raj Green. Now you are thinking “green!! is this man out of his mind.” Calm down and let me explain in case you don’t know. Believe it or not, Raj Green paving is not green. It is a collection of light and dark yellow sand, grey to browns of every shade and includs some very mellow earthy pinks! This I knew from my vast experience would absolutely complement this wonderful old mansion and make it look like it had been there for years. Mrs Clarkson decided she would like to have a quote on this option as I said I would rather walk away from doing this job than putting down something that I knew would not go with the fantastic building and spoil the idyllic setting. Yes you heard that right, the end result is more important to us than the money. We submitted the quote and within a day we had a phone call to say it had been accepted and when could we start. This project was started three weeks later in November. The first thing we had to do was mark out the new paving area. The existing site of the old concrete and shingle areas were then cleared. Once this was done we found really wet and soft clay underneath. We had to excavate deeper so we could stabilise the area. We then brought in type one crushed concrete and spread it over the surface. Unfortunately, before we had a chance to compact this, the heavens opened up. It then continued pouring for the rest of the day and most of the next. When we went back we just could not do anything due to water standing everywhere. We had to pull off site for a week to allow the area to dry out, I didn’t have to explain to the client as she could see the problem for herself. 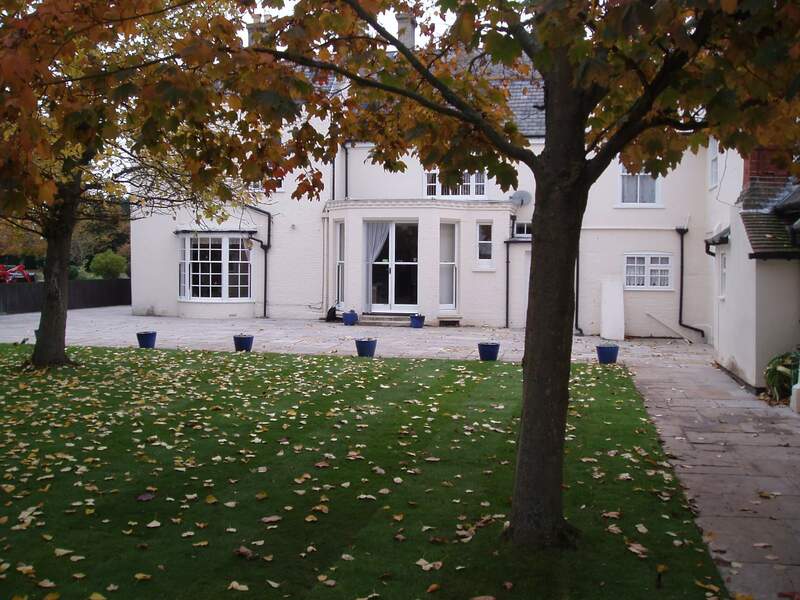 Once we were back we compacted the area down and made sure that all the falls were correct, so once the paving was laid any surface water would run into existing surface water drains and onto lawn areas. We started to lay the raj green paving in a truly random pattern as we had five different sizes of paving to allow us to achieve this. 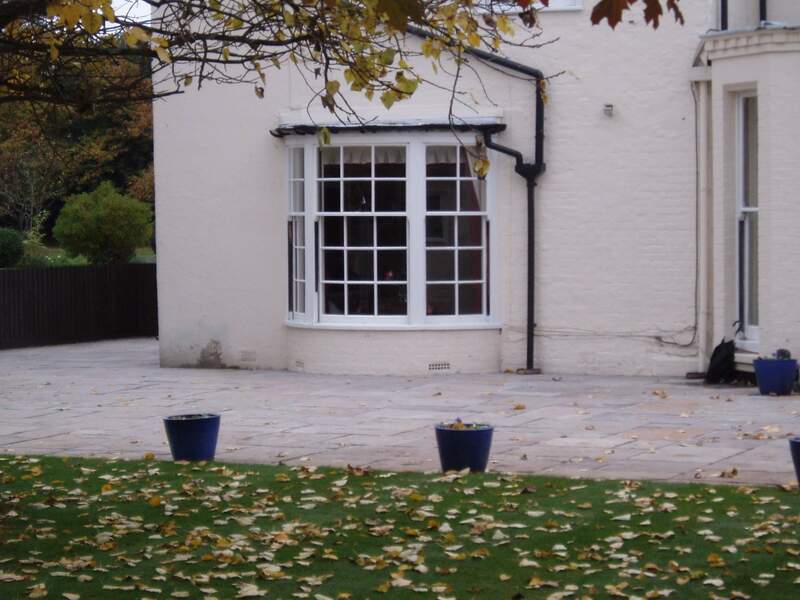 The paving was laid on a 2 inch (50mm) bed of semi dry screed mix with 0.5 inch (13mm) to a 1 inch (25mm) gap between the paving slabs to allow for a mortar joint to lock the paving into position. Just while I am thinking of this did you know there is a right and wrong way to lay these paving slabs? I know these are called Raj Green but don’t say “green side up”. On this paving all the edges are tapered and what a lot of people do, including so called experienced paving contractors, is to lay the paving upside down so the widest part of the slab is at the bottom so forming an upside down pyramid for the joint instead of a pyramid the correct way up to lock the mortar mix in the joint. Why some people will do this incorrectly is because the jointing can be done quicker, but it will not last! The jointing mix we use is the same screed mix we are laying the paving on but add more cement and admix. The cement makes it stronger while the admix – also known as plasticiser, is a liquid that allows the mortar to be pliable without it being runny as you are not putting the water content in. This allows you to put the concrete mix in the joints and over the paving without the worry of staining the paving when ironing in the joints with a tool that is called a jointing iron. We then prepared the new lawn areas by rotovation, levelling and removing any large stones. The grass turves were then laid leaving a striped pattern. To achieve this, all we did was to lay one row of the turves left to right. The next row was laid right to left from where we finished the previous row from and so on. As you can see from the pictures this Indian Raj Green paving just blends itself perfectly. The great thing about it is it looks like it has been there since this wonderful Georgian Mansion was built. The client was over the moon with the end result and was so glad that I insisted on this paving. I did ask Mrs Clarkson what the other quotes were so I could compare our price against the other contractors. Surprisingly, her reply was, “I did not get any more quotations once I had spoken to you. You advised me on what you knew would suit the property. If the product I chose wasn’t suitable,you told me you were prepared to walk away. This alone, absolutely astonished me. You certainly don’t get that happen nowadays. The other thing was you didn’t turn up in a big fancy BMW wearing a suit. I am so glad I went with my instinct as what you have achieved is so wonderful. The summer just can’t come soon enough so I can really enjoy this space. I am already talking to my gardeners. We are planning where we are putting pots and what plants we are going to have”. Another paving job carried out successfully using Raj Green paving. With the end result of having another very happy customer that we can now add to our portfolio. Gregg Jones on What is the secret formula to our success in our commercial landscape maintenance? Bublieliers on What is the secret formula to our success in our commercial landscape maintenance?